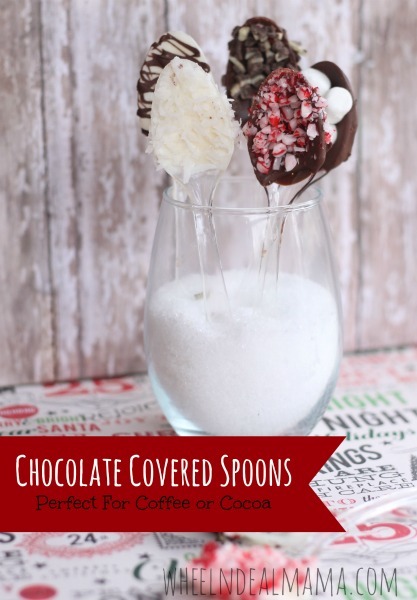 These Chocolate Covered Spoons are a great teacher gift when you individually wrap them and fill a coffee mug, they make a fantastic addition to a coffee or cocoa bar at any Holiday get together, drop a couple off at the neighbors for a thoughtful surprise, or surprise your kids when they come in from the cold with a mug of cocoa and a chocolate spoon. We have even stirred them into our oatmeal). They are also super simple to make which lets the kids get there hands in there and be a part of making a cute, handmade gift. 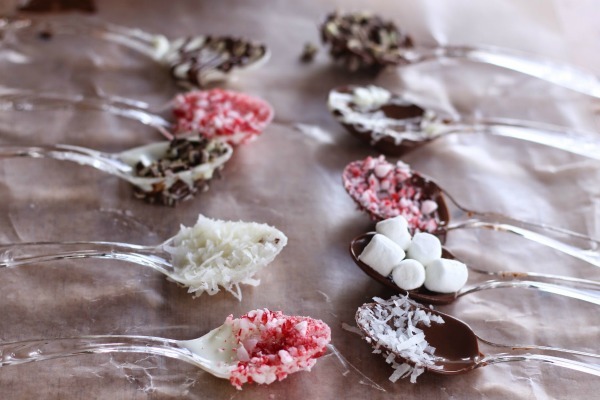 They can also be done in so many flavor combinations, with a multitude of add ons-sprinkles, marshmallows, crushed nuts, coconut, mini chocolate chips- you are sure to find one that fits everyone on your list. Making cookie trays this year? Be sure to include several of these on the platter! Be sure to follow me on Pinterest and check out my other recipes too! You can also use dark, semi, or other flavored chips. Extract- vanilla, coconut, rum, coffee, almond, etc. Place chocolate chips ( I do 1/2 cup at a time of each) in a microwave safe dish. Heat for 30 seconds, stir, repeat until thoroughly melted, stir in 1/4 to 1/2 tsp. oil. 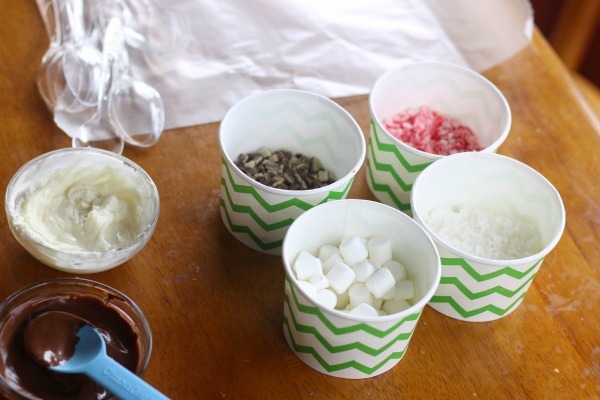 Set out all your items and have them ready- a large piece of waxed paper for placing wet chocolate spoons to set, plastic spoons, dipping items, melted chocolate. 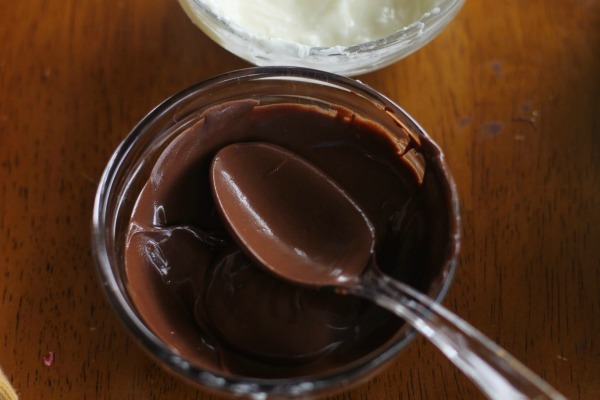 Dip the bowl of your spoon into melted chocolate and turn to coat fully, tap on side to knock off excess chocolate. 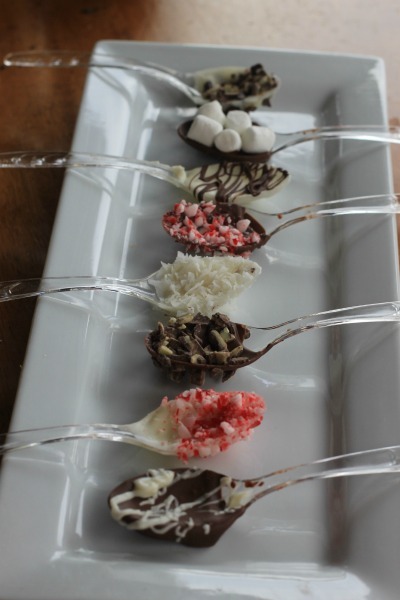 Immediately dip or sprinkle small items onto wet chocolate on spoon, place on waxed paper to set. When chocolate has hardened place spoons in an airtight container or wrap individually in plastic wrap. Wouldn’t this be a great centerpiece for a hot cocoa bar at a party?